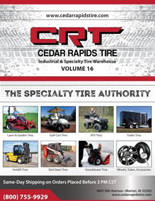 Cedar Rapids Tire is home to all your specialty tire needs. We stock ATV, UTV, lawn, garden, motorcycle and small Ag tires. We are also a known source for hard-to-find gray, non-marking tires. With the broadest specialty tire inventory in Iowa, our on-site warehouse likely has what you need. Specialty tires, like pitching machine and go kart, are just a few of the harder to find items that we carry. If you're looking to tune up your power vehicles, we carry motorcycle and ATV parts and accessories, too. Don't let winter weather stop you! 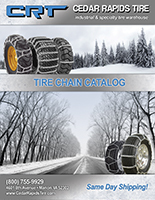 We stock tire chains to the brim with brands like Pewag, Rud, and Wallingford's, among others. We carry several sizes for a variety of machines, from snow blower tire chains to larger applications, like truck and semi tire chains, to industrial and agricultural applications, like forklifts and graders.